walter sanford's photoblog | Showcasing some of my digital photography and videography. Showcasing some of my digital photography and videography. 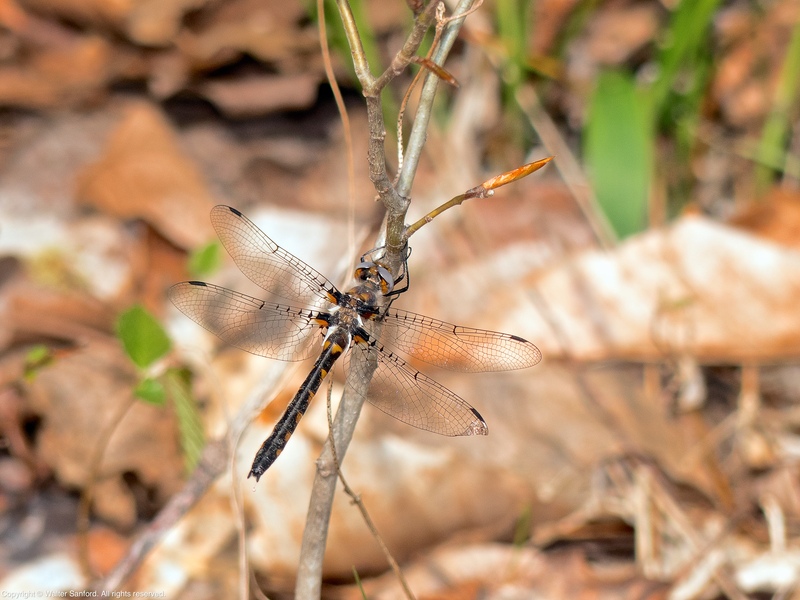 A Uhler’s Sundragon (Helocordulia uhleri) was spotted during a photowalk along a mid-size stream at an undisclosed location in Northern Virginia USA. This individual is a female, as indicated by her rounded hind wings and terminal appendages. All female dragonflies have a pair of cerci (superior appendages) that have little or no function. Both cerci are visible clearly in the full-size version of the following photo. Notice the right hind wing is slightly malformed. It appears the wing failed to inflate completely during emergence. The malformation didn’t impair her ability to fly. Pollen (probably tree pollen) is especially noticeable on the darker parts of the body. Bear in mind, Dr. Roble’s records are for the entire state, therefore the adult flight period for H. uhleri seems to be longer than it is in reality. The adult flight period for a single site is probably no more than a month, and more likely around two-to-three weeks. For example, according to records for Northern Virginia maintained by Kevin Munroe, former manager of Huntley Meadows Park, the adult flight period for Uhler’s is 11 April to 05 May. It’s also worth noting that the window of opportunity to see Uhler’s Sundragon closes rapidly after trees are in full leaf. Is Uhler’s Sundragon common? I guess the answer to that question depends upon where you live. In Northern Virginia, Kevin Munroe classified H. uhleri as “rare.” In fact, I’m aware of only one location in Northern Virginia where Uhler’s Sundragon can be found with reasonable certainty. Copyright © 2019 Walter Sanford. All rights reserved. A Uhler’s Sundragon (Helocordulia uhleri) was spotted during a photowalk along a mid-size stream at an undisclosed location in Northern Virginia USA. Uhler’s Sundragon is a new species for my life list of odonates. This individual is a male, as indicated by its “indented” hind wings and terminal appendages. Planning for the next season is a good way to stay connected with odonates during the winter months. 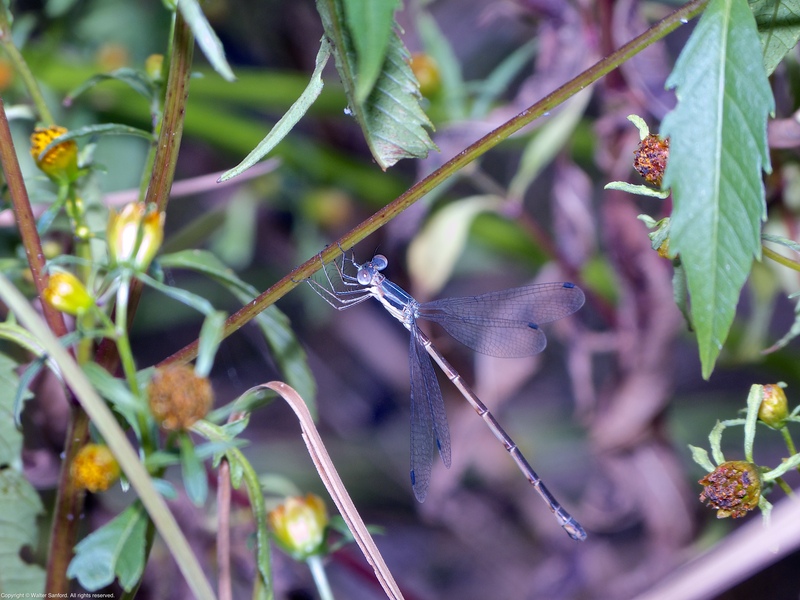 One off-season activity that can pay big dividends in the future is to research sites for finding new life-list species of dragonflies and damselflies, especially rare and uncommon species. I’ve been dogged by, er, let’s just say “transportation issues” for months. Sincere thanks to my buddy Mike Powell for scouting one of the sites I researched and guiding me to a couple spots where he found Uhler’s. Good work, Mike — couldn’t have done it without you! 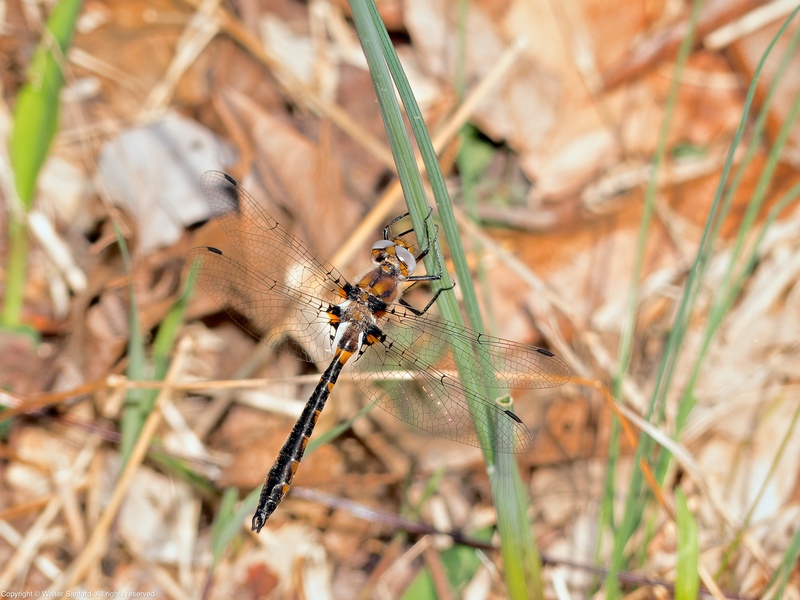 Also thanks to Michael Boatwright, founder and administrator of the Virginia Odonata Facebook group, for providing lots of practical tips for finding Uhler’s Sundragon in the field. Close readers of my blog may have noticed I’ve posted a lot of photos recently that were taken years ago. Why were the photos passed over for publication closer to the time the shots were taken? Sometimes there are better shots from the same photowalk that I’m eager to share, and sometimes they just don’t make the grade. The former requires no explanation; the following photos help to illustrate the latter. The following female Slender Spreadwing damselfly (Lestes rectangularis) was spotted during a photowalk around a vernal pool in the forest at Huntley Meadows Park. The damselfly was perched in a hidey-hole in the vegetation at angle that made it impossible to get the entire subject in focus from head-to-tail. The first photo shows the head and thorax in focus, but the tip of the abdomen and terminal appendages are out of focus. The last photo shows the tip of the abdomen and terminal appendages in focus, but the head and thorax are in soft focus. Look closely at a full-size version of the photo and you can see both styli (sing. stylus), structures that serve as sensors (like “curb feelers“) in egg positioning during oviposition. The odd thing is the focus point is nearly the same in both photos, and the aperture is identical. Go figure! Anyway, less than ideal focus is something that will cause me to reject photos every time. And then there’s that “too hot” blade of grass in the lower-right corner — talk about distracting! A Great Blue Skimmer dragonfly (Libellula vibrans) was spotted near a vernal pool in the forest at Huntley Meadows Park (HMP), Fairfax County, Virginia USA. This individual is a mature male, as indicated by his terminal appendages, discolored abdomen, and tattered wings. This male has mated many times, as indicated by the scratches on his abdomen. Males that have mated often have marks on their abdomen where the female legs have scratched them. This is especially obvious in species in which males develop pruinosity, as the pruinosity on the mid-abdomen is scratched off, and the signs are visible at some distance. Source Credit: Paulson, Dennis (2011-12-19). Dragonflies and Damselflies of the East (Princeton Field Guides) (Kindle Locations 390-392). Princeton University Press. Kindle Edition. So close, yet so far! 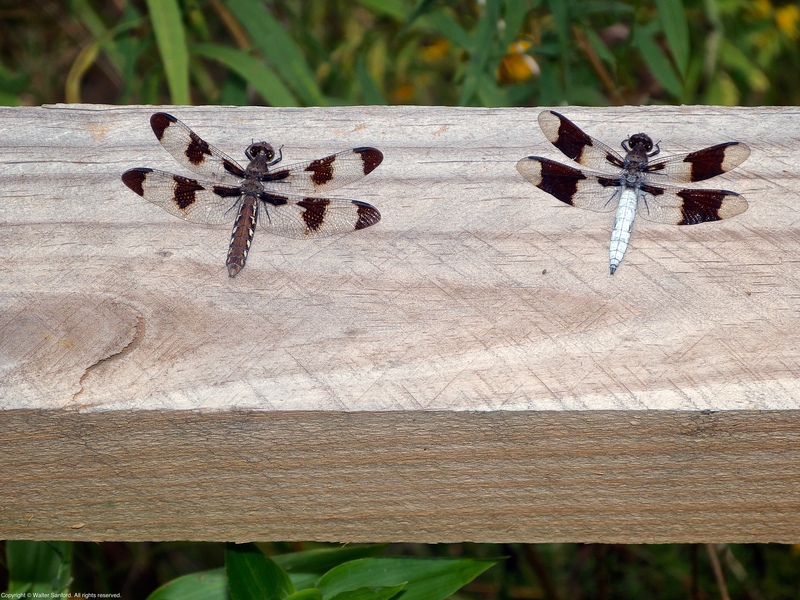 Two Common Whitetail dragonflies (Plathemis lydia) were spotted perching on a wooden fence rail located near the terminus of the Hike-Bike Trail at Huntley Meadows Park (HMP), Fairfax County, Virginia USA. The individual shown on the left is a mature female; the one on the right is a mature male. For many of the common species of odonates found in Northern Virginia, I created a collection of annotated guides that illustrates how to differentiate gender by looking at terminal appendages. The difference in the pattern of wings spots for male and female Common Whitetails is sufficient to identify gender. 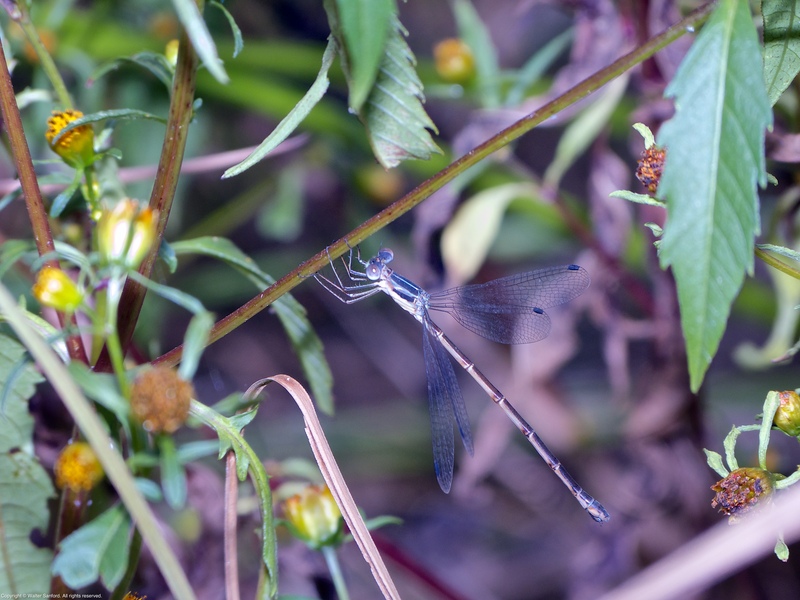 Odonates (dragonflies and damselflies) are aquatic insects that spend most of their life as larvae that live in water; this stage of their life cycle can last from a few months to a few years, depending upon the species. Finally, they emerge from the water and metamorphose into adults in order to reproduce; their offspring return to the water and the cycle begins again. I wonder how these two mature adults were able to be so close yet resist the compelling biological urge to hook up! 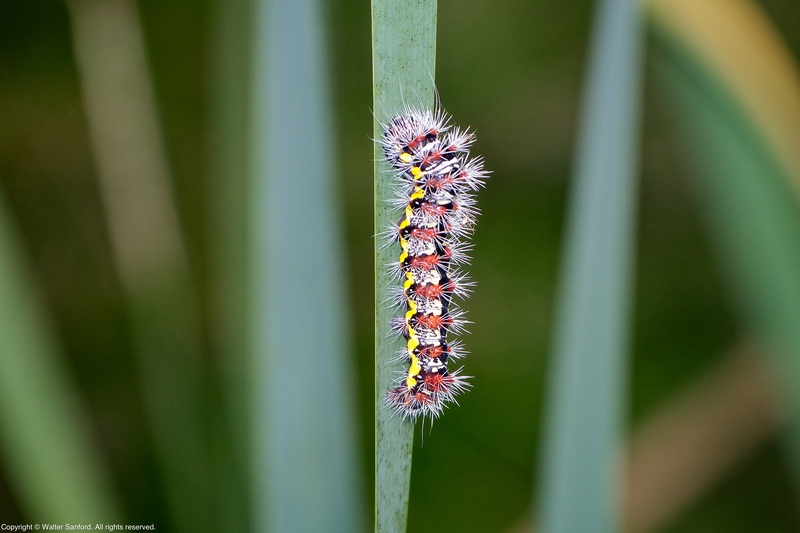 A Smeared Dagger Moth caterpillar (Acronicta oblinita), a type of stinging caterpillar, was spotted on 15 September 2016 during a photowalk along the boardwalk that goes through the central wetland area at Huntley Meadows Park (HMP). Thanks to Mike Powell, fellow wildlife photographer and blogger, for identifying this unusual caterpillar way back when both of us were less experienced amateur naturalists. 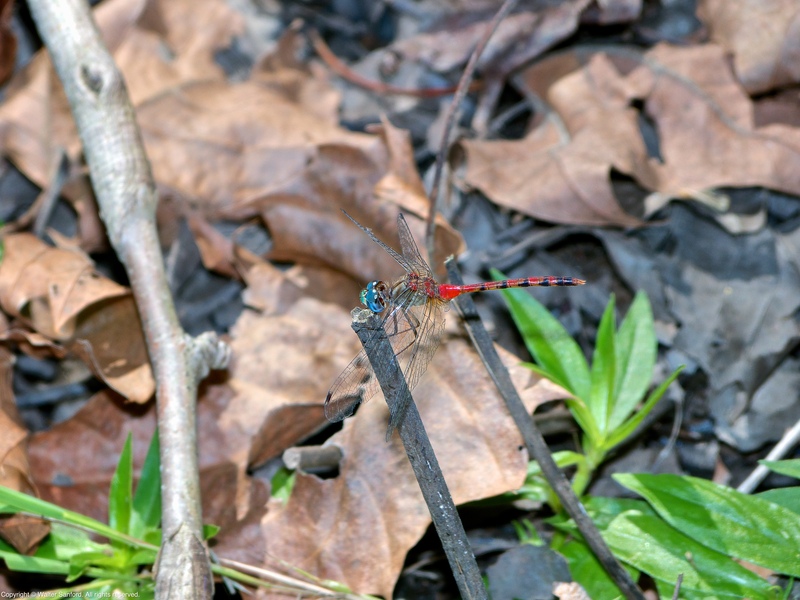 Two Blue-faced Meadowhawk dragonflies (Sympetrum ambiguum) were spotted at Old Colchester Park and Preserve (OCPP), Fairfax County, Virginia USA. 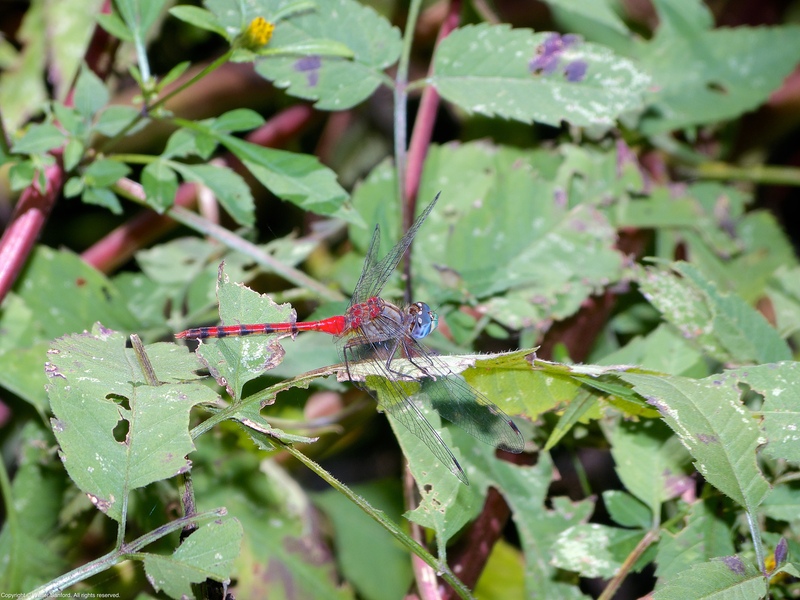 There is a true vernal pool at the park where Blue-faced Meadowhawks are relatively abundant. Both individuals are male, as indicated by their coloration and terminal appendages. 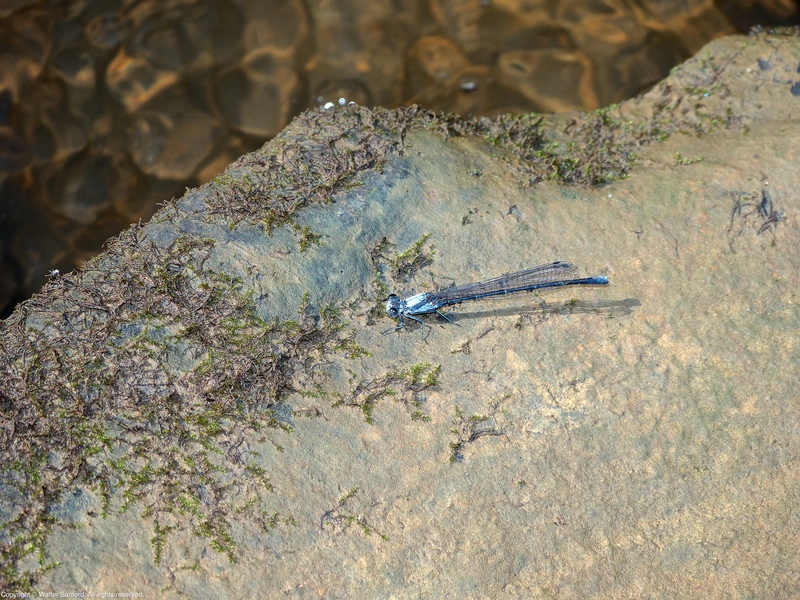 Two Powdered Dancer damselflies (Argia moesta) were spotted along Popes Head Creek near the town of Clifton, Virginia in Fairfax County USA. The stream is accessible via Chapel Road Park. 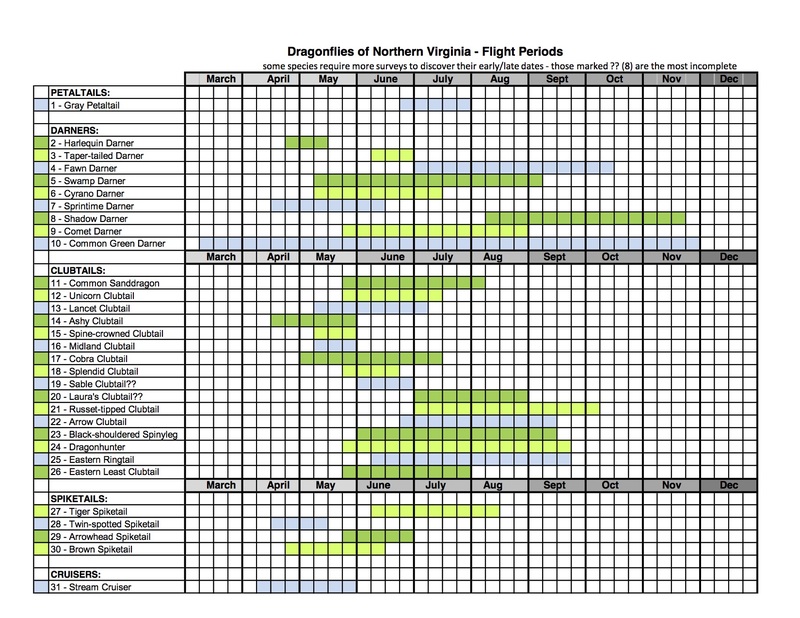 Google Calendar was used to synthesize “CHECKLIST OF THE DRAGONFLIES AND DAMSELFLIES OF VIRGINIA, April 2017 update” — Dr. Steve Roble’s excellent datasets for the Commonwealth of Virginia — into two calendars: Dragonflies (VA Flight Dates); and Damselflies (VA Flight Dates). 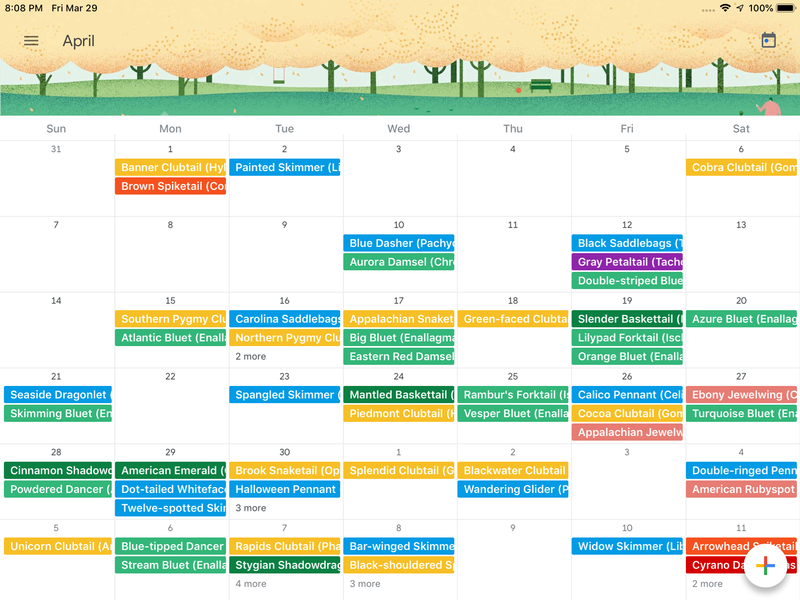 The Google Calendar default color palettes were used to color-code both calendars: Dragonflies is Graphite; and Damselflies is Birch. 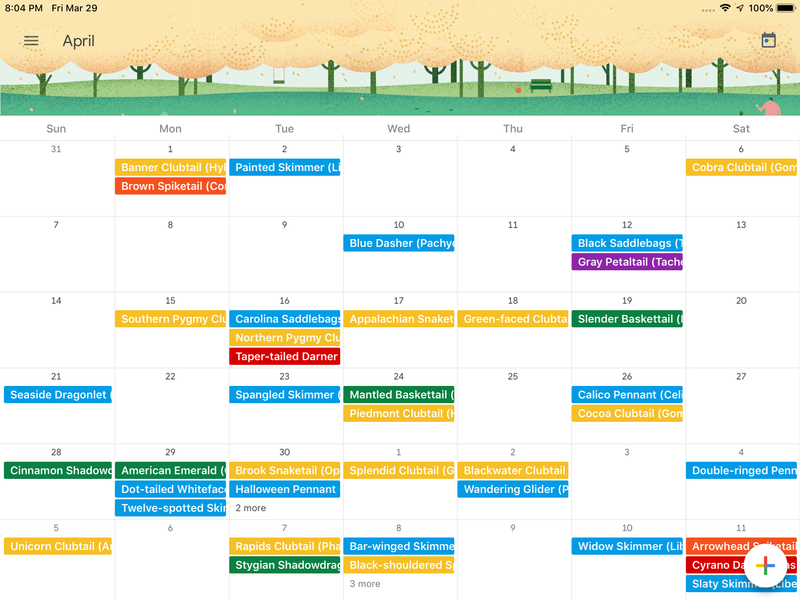 Individual events on each calendar are also color-coded by family. Here’s the way the dragonflies calendar looks using the Chrome Web browser on my Apple iMac desktop computer. Notice the Graphite colored vertical bar to the left of each event that indicates it belongs to the dragonflies calendar. 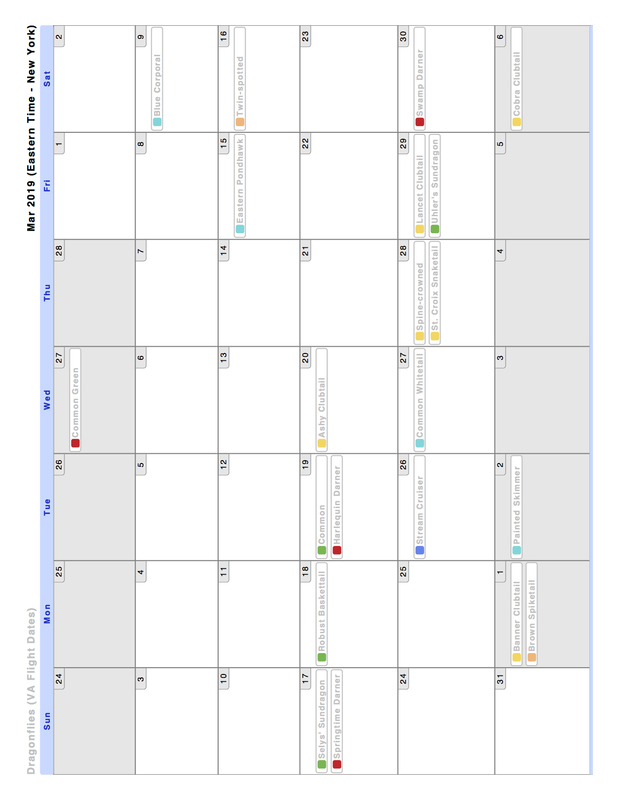 And here’s the way the dragonflies calendar looks using the free Google Calendar app on my Apple iPad mini 2. Every event features the following information: common name; scientific name; early-date/late-date; abundance; and habitat. An interactive version of both calendars is available online. The dragonflies calendar is shown below. 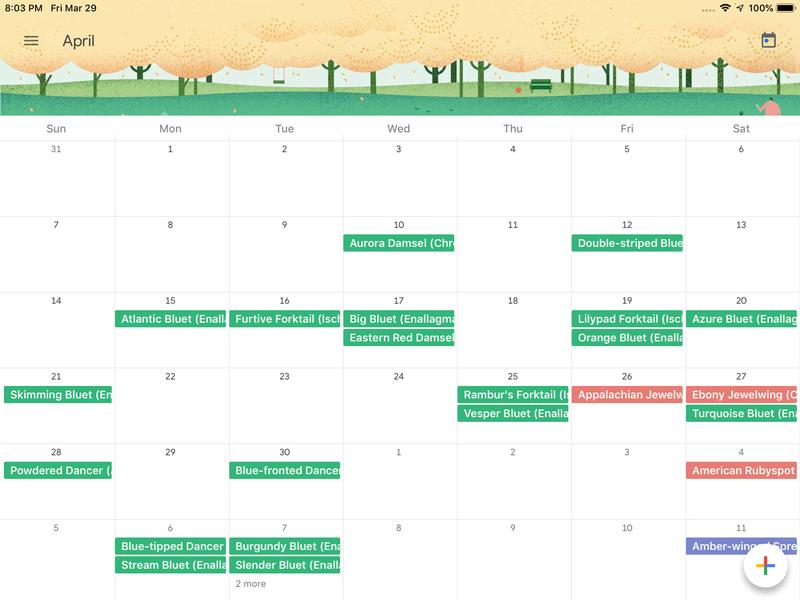 Regrettably, the color-coding is lost in the online, interactive version of both calendars. That is, unless you print the calendar. Color-coding is also lost when the calendar is exported as an “.ics” file. That’s the bad news. 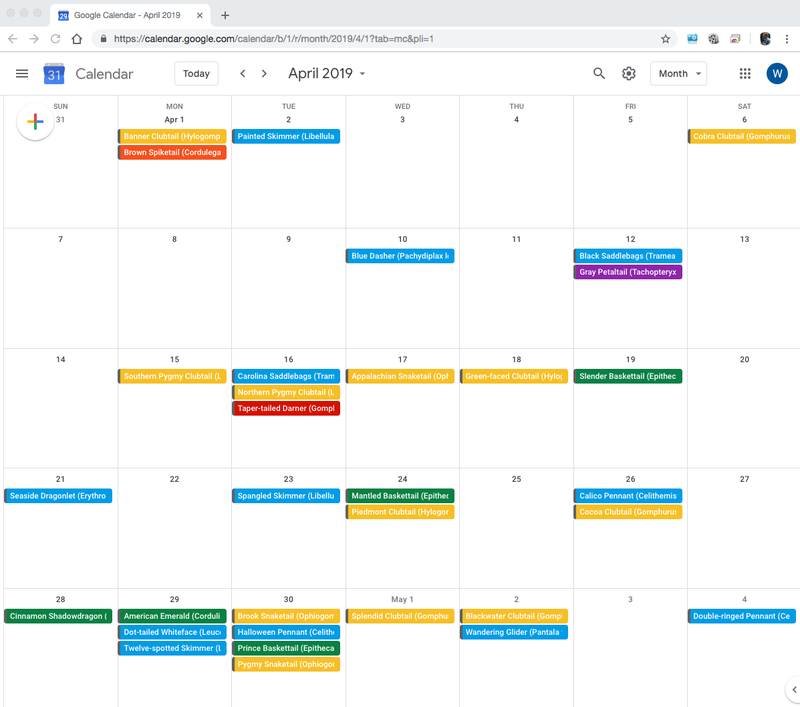 The good news is the calendar can be edited after it is imported into Google Calendar and it’s easy to edit the entries to color-code them any way you like. 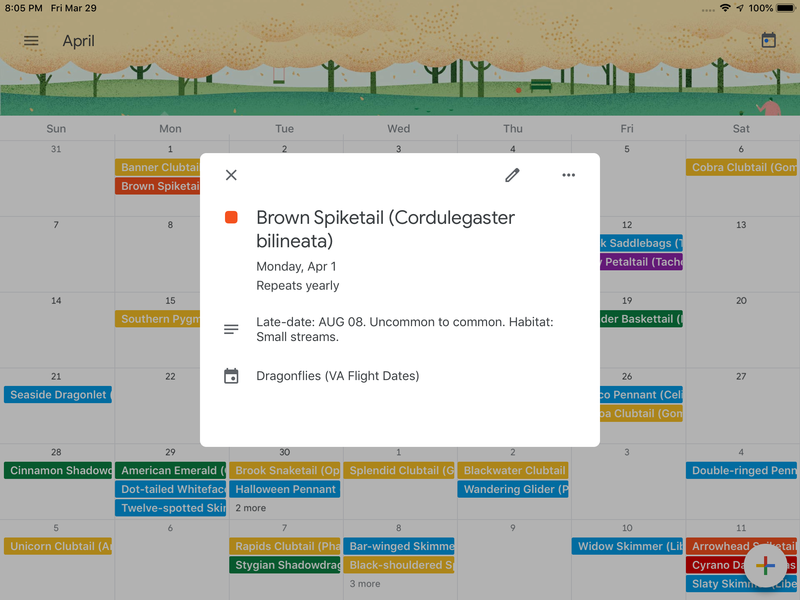 The colors of the rainbow (ROYGBIV) were used to color-code the seven families of dragonflies; the equivalent colors in the Google Calendar default color palette are shown in brackets. The colors for Emeralds and Clubtails were flip-flopped because it just makes sense the Emeralds should be color-coded green! Here’s the way the damselflies calendar looks using the free Google Calendar app on my Apple iPad mini 2. 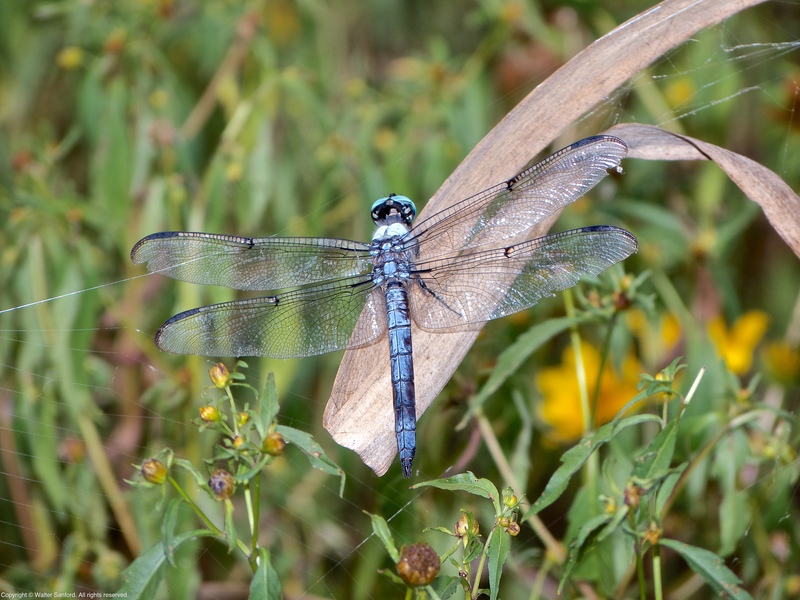 Like the dragonflies calendar, every event features the following information: common name; scientific name; early-date/late-date; abundance; and habitat. 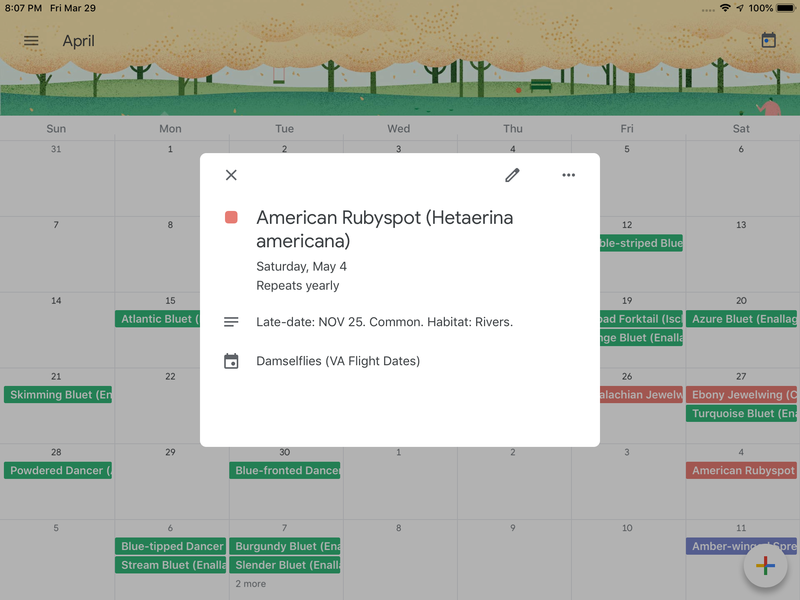 “FSL” was used to color-code the three families of damselflies common to the mid-Atlantic states (USA); the equivalent colors in the Google Calendar default color palette are shown in brackets. For what it’s worth, all of the colors for the damselflies calendar are pastel shades. An interactive version of the damselflies calendars is available online, as shown below. The damselflies calendar was updated for 2019 so that no colors are duplicated from the dragonflies calendar. This should help to eliminate confusion when both calendars are displayed at the same time, as shown below. As I worked on the calendar, patterns began to emerge that I hadn’t noticed before. For example, it’s clear that the serious odonate hunter needs to hit the ground running as soon as early March. Remember that Dr. Roble’s dataset is for the entire state. You may not see a given species on its early-date, but it could be seen on that date and certainly can’t be seen if you don’t look! Mouse-over the name “Test Calendar” and click on the vertical column of three dots, labeled “Options for Test Calendar” then select “Settings and sharing.” In the upper-left sidebar, click on “Import and export”; select the “.ics” file to import and select “Test Calendar” from the drop-down menu labeled “Add to calendar.” There are 143 events in the Dragonflies calendar; 56 events in the Damselflies calendar. If you decide to color-code individual events like I did, click on an event then click on the pencil icon labeled “Edit event.” Select a color and click the “Save” button, then click the radio button for “All events.” Beware: You can right-click on an individual event and change its color but DON’T GO THERE! That results in an event that doesn’t occur annually using the new color you chose. Kevin Munroe, former manager of Huntley Meadows Park, created an excellent calendar called Dragonflies of Northern Virginia – Flight Periods. 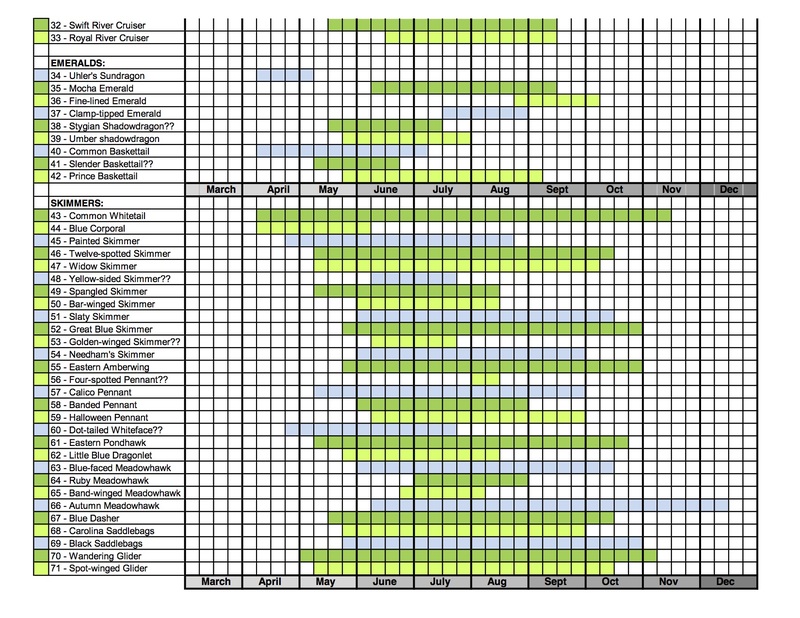 This calendar is a valuable resource for hunting dragonflies in Northern Virginia. I think the value of Kevin Munroe’s calendar is enhanced by using it in combination with my visualization of Steve Roble’s dataset. 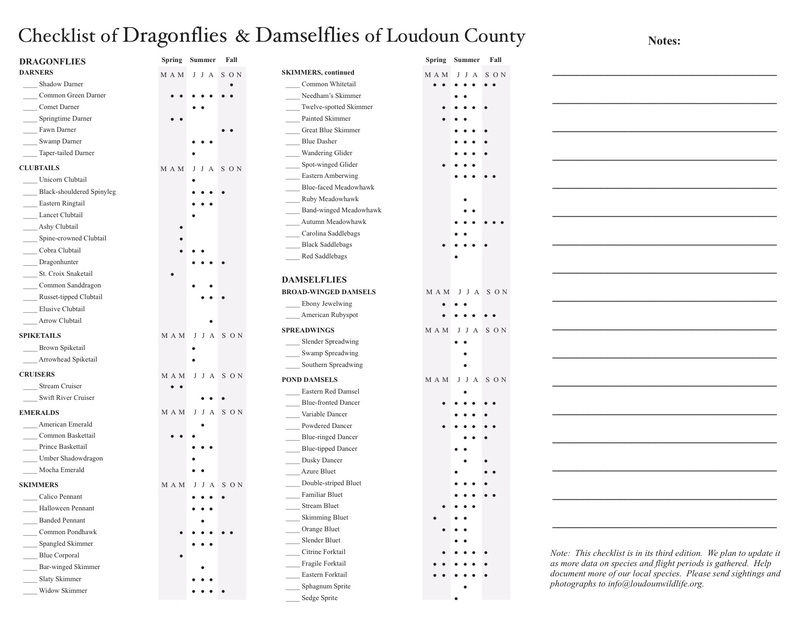 Dragonflies & Damselflies of Loudoun County features a flight calendar for dragonflies and damselflies. A Powdered Dancer damselfly (Argia moesta) was spotted during a photowalk along a small stream at Hemlock Overlook Regional Park, Fairfax County, Virginia USA. This individual is a female, as indicated by her coloration. Female Powdered Dancers are polymorphic: this is the tan morph; there is also a blue morph that looks somewhat similar to males of the same species. Also notice the female’s abdomen is thicker near the tip than the tip of a male’s abdomen, due to female egg-laying anatomy. Sincere thanks to Michael Boatwright, founder and administrator of the Virginia Odonata Facebook group, for help in identifying this specimen. My tentative identification, recorded in field notes dated 10 May 2017, proved to be incorrect. 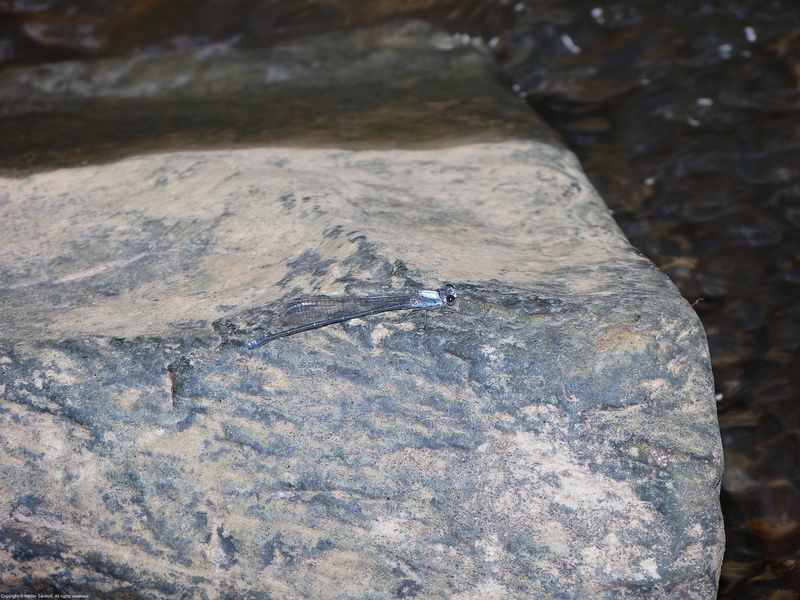 I’m comfortable identifying some members of two of the three families of damselflies that occur in the mid-Atlantic states (USA), including Family Calopterygidae (Broad-winged Damselflies) and Family Lestidae (Spreadwings). 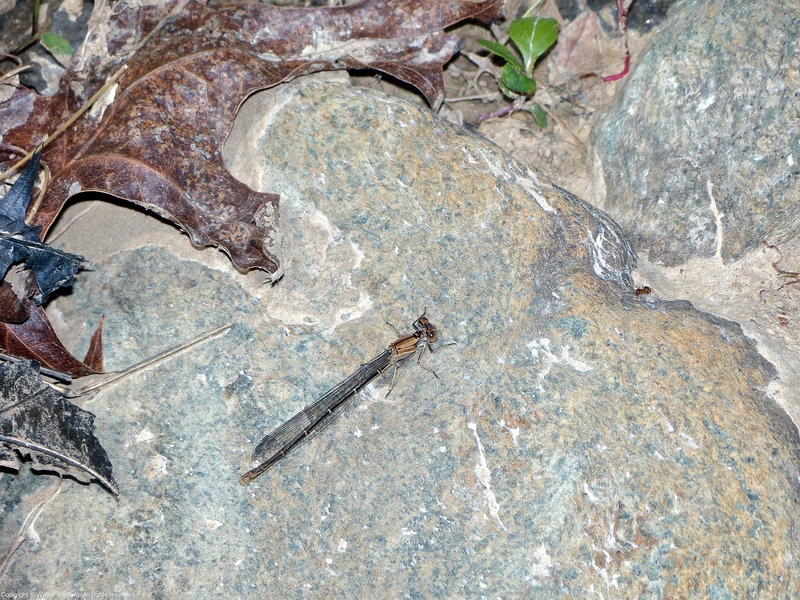 Most members of the Family Coenagrionidae (Narrow-winged Damselflies), not so much. I remember clearly the time when I was learning to identify dragonflies. I was more than a little confused at first. With persistence, the puzzle pieces started to fall into place sooner than I expected. Same story when I started learning to identify odonate exuviae. Never happened with damselflies, for whatever reason.